The seventh installment of the prized AVO Limited Edition Improvisations Series has arrived ~ the AVO Improvisations Series LE19! 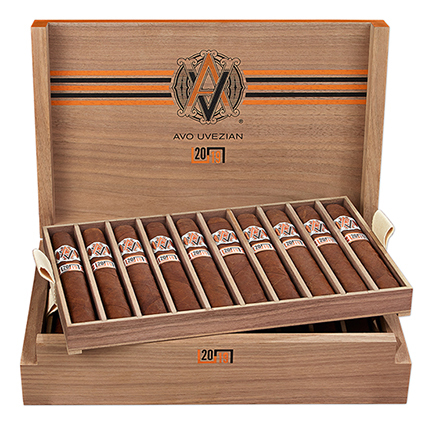 These premium cigars celebrate Maestro Avo Uvezian who first introduced the annual limited edition cigar concept to the world in 2001 and they are only the second in this series to be box pressed. The Improvisation LE19 blend is a symphony of tobaccos from three different countries that begins with five different filler tobaccos comprised of both Dominican and Peruvian leaves enveloped by a Dominican binder and finished with a stunning dark brown Ecuadorian wrapper. These beautifully constructed cigars are silky to the touch, medium- to full-bodied, and deliver complex notes with the perfect balance of thick cream and earthy spice. The AVO Improvisation LE19 packaging is inspired by the box pressed cigar molds used to shape the cigars in the rolling process. Only 2,500 boxes of these very rare cigars were produced exclusively for the US market.